At first, Bear Witness, an Ottawa-based DJ, only meant to throw a party for his friends. In 2007, Witness had been playing the Ottawa club scene for over a decade when he and his friend Ian Campeau, who spins records under the name “Deejay NDN,” decided to host “Electric Pow Wow,” a party night geared at the city’s indigenous community. They advertised around Native spaces like the local community center. That first night, they drew fans, Native and non-Native alike, from across the city. A few years later came what Witness called the “eureka moment.” At that point, with the addition of Dan “DJ Shub” General, the group of indigenous Canadians was spinning under the name A Tribe Called Red. Experimenting with producing their own mashups, they were laying tracks using standard club fare — electronic, hip hop, reggae, dubstep — when someone dropped in a Powwow sample. Since then, A Tribe Called Red has produced two full-length albums of highly danceable, politically charged music that combines traditional Native singing and drumming with club music and hip-hop beats along with samples from pop culture and the news. 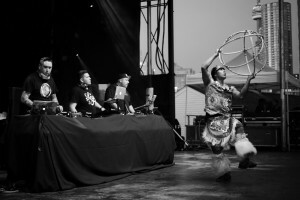 The group toured North America in the spring of 2013, and then toured Europe after adding Tim “2oolman” Hill, who replaced DJ Shub after he left in the spring of 2014. Their trademark “Powwow step” style defies easy categorization, but is attracting recognition. Last year they won a JUNO, Canada’s highest music award, for Breakthrough Group of the Year, the first Indigenous artists to win in a non-Indigenous category. It’s a sign of “this amazing diffusion that’s happening,” said Anya Montiel, a Yale Ph.D. candidate who studies Native American art and culture and who has written about the group for the Smithsonian’s “American Indian” magazine. They accomplish this in part by “holding true to some of the core musical features of Powwow music,” Christopher Scales, an ethnomusicologist who specializes in Native American music and Powwow culture, said. The pulsing, unceasing dubstep beat the group uses mirrors the steady, central host drum that anchors Powwow music. Scales also points to a particular rhythmic structure — a unique syncopation, where the melody or vocals are purposefully off-beat — that is sometimes lost when non-Native musicians sample Native music. By using these same musical elements, Tribe is reclaiming the right to carry on their own heritage. In the song “General Generations,” the group samples from 80-year-old archival recordings of some Cayuga tribe rituals. In the 1930s, anthropologist Frank G. Speck worked with Cayuga chief Alexander J. General to observe and record the rituals. Those recordings were tucked away in the Archives of Traditional Music at Indiana University before Tribe sampled them. And before he DJed full time with Tribe, Witness was an experimental video artist, crafting installations specifically “looking at misrepresentation of Indigenous people in media, recontextualizing it, taking it apart, finding ways to take the negativity away from images and focus on things that I find empowering,” he said. Now Witness’ video work is central to the group’s live shows. He creates visual mashups of stereotypical, racially charged representations of Native people – think “Cowboy-and-Indian” scenes in Westerns, old Disney cartoons or that moment in “Back to the Future 3” when Marty McFly gets chased by a whooping tribe on horseback. The group DJs in front of huge screens displaying this work, which they say is intentionally jarring in the context of a dance party. The performances let the audience draw their own conclusions about how Native people are represented, Montiel said. “For the non-Native audience, they’re becoming inundated by these racist and troubling images, which causes them to say, ‘I grew up with this and thought it was OK, but now that I’m seeing this, one after the other, this isn’t a proper portrayal of a people,’” he said. Sometimes the substance of Tribe’s music is expressly political. The song “Woodcarver” splices together news footage about John T. Williams, an unarmed Native man killed by Seattle police in 2010, which sparked protests against law enforcement’s interactions with indigenous communities. In fact, the act of creating Powwow music is “itself a political act,” Scales said. Powwow was banned in North America for much of the 20th century in a wave of “assimilation” laws that outlawed many Native religious practices and the teaching of traditional languages. The group’s “Electric Pow Wow” club night is still going strong: it frequently sells out Ottawa’s Babylon Nightclub every second Saturday of the month. A rare instance of Native youth seeing themselves represented in broader pop culture, the club night is a powerful presence in the city, Witness said. A Tribe Called Red tours reservations to engage with Native youth and just wrapped a tour this month. And the group frequently hosts workshops before its concerts, so attendees have an opportunity to speak explicitly about how they relate to the group’s work and the ideas that come up within their performances. Witness pointed out that young Native kids do have role models and revered elders within their own communities. But it’s different when the figures that you relate to and admire are accepted, and respected, within a larger cultural realm, he said. Listen to more of A Tribe Called Red’s music below.